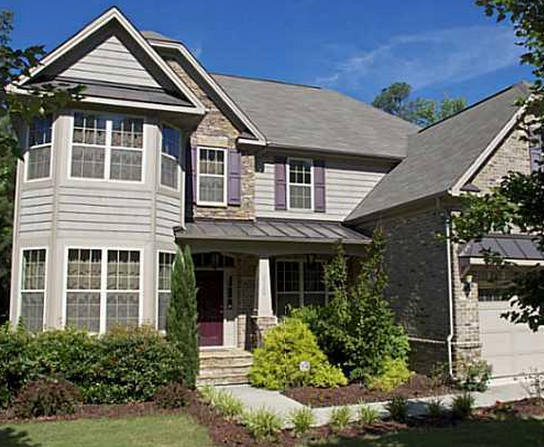 Highland Creek is an attractive location full of beautiful single-family homes of various styles. There are several different neighborhoods here: Highland Creek Towns and Gables, Highland Creek Commons, Highland Creek Glen, and Highland Creek Village. This development area in Raleigh, NC, comes with tons of great built-in amenities. The neighborhood has a huge resident’s lounge for private parties and workshops. The area has many recreational features including, a junior Olympic swimming pool and a kiddie pool with slide and splash areas. Highland Creek offers a state-of-the-art fitness center available to all the families in the subdivision. These amenities give the area all you can need to entertain your family right at home. The Highland Creek area is close to Forestville Rd, 401 (Louisburg Rd), and 540 for those who need to commute to work or just to get to the various attractions around Raleigh. The area also has some conveniently located benefits. Directly across the street is the Forestville Crossing Shopping Center. This shopping center includes a Lowes Foods and several restaurants, as well as a Planet Fitness. Giving this area a one-stop shop for dinner and groceries. There is also a Super Wal-Mart, Super Target, Lowe’s, Home Depot, Staples, and Pet Smart in the vicinity. Raleigh has an abundance of things to do and explore for kids and adults. There is the North Carolina Museum of Art, North Carolina Museum of Natural Sciences, and Marbles Kids Museum and historic locations such as the North Carolina Museum of History and Yates Mills Park. As well as various entertainment venues such as The Time Warner Cable Music Pavilion, PNC Arena, and Raleigh Little Theatre. For the more outdoorsy types, there are several parks and state forests in the area including Durant Nature Park and E. Carroll Joyner Park, which are both nearby. Other notable parks include Clemmons Educational State Forest and Pullen Park which has available a carousel ride. Popular shopping destinations in Raleigh include the Crabtree Valley Mall, Triangle Town Center, and The Streets at Southpoint. For those looking for a smaller boutique style shopping experience there are the North Hills and The Shops of Cameron Village. Raleigh also boasts a State Farmers Market that is open year round. Wake County offers an excellent school system. Highland Creek children will be assigned to Harris Creek Elementary School, Rolesville Middle School, Rolesville High School, or Heritage High School. There are also other calendar and magnet educational options. In addition to these schools there are several accredited daycares and preschools available to families with younger children.